But the good thing with keeping busy, is that after a while - you have something to show for! So here's what i've been working on for Comp. 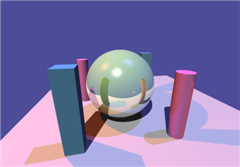 Graphics course - A Ray Tracer. So basically, in the exercise we had to render a scene defined in a made-up scene language. The language has definitions of some primitive objects: Rectangle, Box, Sphere etc. And definition of various types of lights. The scene definition should be parsed, and the scene should be kept in memory. 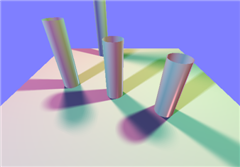 The next step is to render the scene by shooting rays and checking for intersections. A ray is shot from the "eye of the beholder" (user's eye), through all the pixels in the viewing pane (a part of the screen) and on to scene. 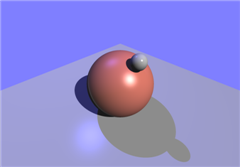 The ray consists of an origin point P0, and a direction vector V. The goal is to find the distanct t from the eye to the nearest object in the scene. There's a whole bunch of theories of shooting the rays, lighting models, reflecting rays, intersection and more. But I won't bore you with details.